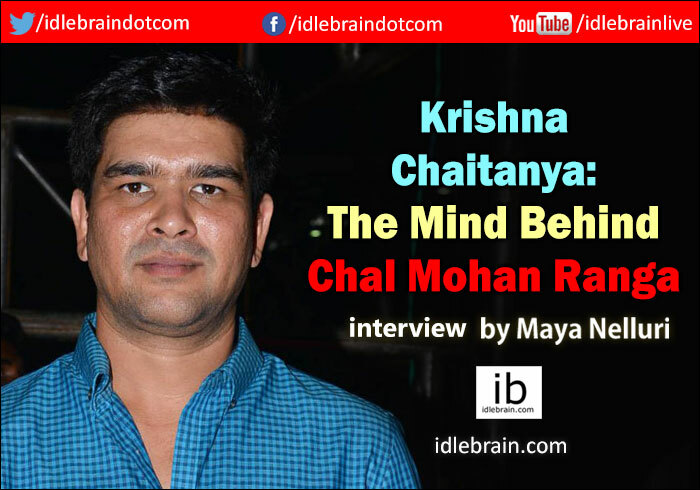 Successful lyricist turned successful director Krishna Chaitanya speaks exclusively to Idlebrain about his second directorial venture – Chal Mohan Ranga. Although he tends to shy away from limelight, Chaitanya’s talent has always shone through, bagging him over 500 songs and multiple direction opportunities. We had to coax him a little to let us into his secretive world but eventually we managed to get some insights into his life leading up to his debut Rowdy Fellow and how he got around to working with two of the biggest names in Tollywood – Pawan Kalyan and Trivikram, producers of the film. Read on to find out more. You started your career as a lyricist; how did you end up getting into direction? People don’t really know this about me but I was always into direction. Right from the first film I worked for (Sambhavami Yuge Yuge) I used to be in the direction department working as an AD (assistant director). So why did you foray into lyrics first? Becoming a lyricist was basically due to economic reasons. As you might know you don’t get paid much working as an AD and people at home were worried about how I would survive. Since I studied Engineering, they believed that taking on a job would be a much better choice. It forced me to think about and ensure that my finances were going to be taken care of. As for becoming a lyricist, it just kind of happened. I don’t really know why I took it up but once someone asked me if I can write and I said I could. At that point I thought I’ll probably write a few songs and that will be it. How many did you end up writing till now? I really didn’t think I would write so many but I’ve been lucky enough to write somewhere between 500 and 550 songs in my career. That’s a lot! Where do you find your inspiration? My inspiration usually comes from the director’s narration. It’s a combination of situations and people. There is something in everyone that inspires me. And there are also a lot of books by great writers that I’m inspired by. Coming back to your directing, Rowdy Fellow was your first film; how was the response to it in the industry? It’s a funny story. Just after the release I got a couple of calls from an unknown number so didn’t pick it up. Later through a common friend I got to know that it was actually Trivikram garu who was trying to call me. I was heartbroken that I didn’t end up picking up the first time. Apart from that late Dasari Narayana Rao garu, Krishna Vamsi garu and then every director I met told me that Rowdy Fellow was a very nice film. Of course it always feels good when people talk positively about your work. Big names like Pawan Kalyan and Trivikram are associated with your current film Chal Mohan Ranga; how was it to work with them? I used to feel like it would be a great opportunity if I just saw either of them once. I never thought that I would work in their banner. And the fact that this is the first film in PK Creative Works makes it a huge honour for me. It’s also more of a responsibility for me because to put it simply nothing I do will bring them any new accolades; my duty is not to get them a bad name. If you are asking about the process of working with them, it was a cake walk because they gave me so much freedom and trusted me. As we all know filmmaking is a tedious process so the comfort of the journey is solely determined by the people supporting us. I cherish a lot of memories with Trivikram garu. I learnt so much from him about being a good human being. When I think about how many great things he’s written, all I see is the life experience behind it. One must have experienced life so fantastically to be able to write so beautifully. In fact, the way both Trivikram garu and Kalyan garu look at life taught me a lot. The first time I really spent time with Kalyan garu was when Trivikram garu left me with him for an entire hour. He listened to all the songs and seemed to quite like the ‘very very sad’ song. He also was interested in checking out the looks of the actors. And once we finished the US schedule shoot, he asked if I was satisfied with the output and even enquired whether I would like to go there again to re-shoot anything. That was really very sweet of him. On top of that both of them never come on set; I would only go meet them when required. The name of the film is quite unique; who chose it? Chal Mohan Ranga was the working title that I came up with. Trivikram garu said it’s beautiful so we went with it. How was it working with Nithiin? Nithiin is a friend with whom I can share anything and everything, right from silly gossips to serious intellectual discussions. We share a great bond. He is also someone who believed in me a lot from the beginning. He told me before Rowdy Fellow that he would do the next film with me and right after the release he called to say the same. He is a man of his word, a fantastic human being, and a brilliant actor. In this film he surprised everyone, he was absolutely amazing. What is your opinion of Megha Akash? I actually saw her in Gautham sir’s rushes. At the same time she was being looked at for the movie Lie with Nithiin. So when I and Nithiin spoke about options for our actress, we were both thinking of the same girl – Megha. She is very sensible and an intelligent actor. She understands and delivers exactly we require. What can we expect from Chal Mohan Ranga? You can expect FUN! Whatever is in the trailer is the story. We all know this story because it is one that has been written about from time immemorial. Since the era of Shakespeare to now, love stories are all the same. Boy meets girl, they separate and then they get back together. The only difference how this story is told. In Chal Mohan Ranga, we meet a simple man, much like us, who wants to achieve small goals. Then he meets the girl. The way the story unfolds is truly nice. You’ve been doing a lot of interviews for the release; how do u feel about the interview processes? We’ve heard many times that you manage to stay level headed under any circumstances. What is your secret? In my films, I know what I want and everyone knows what they are required to do so things flow rather smoothly. Of course small hindrances happen but that’s natural. I believe that things will fall into place. Regardless of whether we yell or not the outcome will be the same. But yelling spreads negative vibes and if you yell a lot everyone gets used to it and even stops responding to it. It’s just better to stay calm. There are a few things in discussions but I will decide after this release.